Peterborough Cathedral is considered to be one of England’s most beautiful medieval buildings, and at our meeting on 8th November, Dr Jonathan Foyle will give an illustrated talk about its unique architecture. Jonathan is well known as a lively and engaging speaker. He grew up in Deeping and holds degrees in Architecture, History of Art and Archaeology. His latest book titled “Peterborough Cathedral – a Glimpse of Heaven” was timed to celebrate its 900th anniversary. Construction of the present church began in 1118, after earlier monastery buildings were accidentally destroyed by fire. A previous monastery was also burned down in 1070 by “men from all over the fens” led by a local landowner named Hereward. In an attempt to overthrow their new Norman rulers, he combined forces with a Danish king. The Anglo Saxon Chronicle states they arrived in Peterborough by boat and seized the Abbey’s treasures, including gold and silver shrines, fifteen great crosses of gold and silver, and “the arm of St Cuthbert” – a holy relic. Hereward the Outlaw, as he was called at the time, became a legendary hero after he evaded capture by William the Conqueror at Ely. He later became known as Hereward the Wake, when the Wake family who owned the Manor of Deeping, claimed to be descended from his daughter. In 1380 when Blanche Wake died, a summary was made of her land holdings and income from Deeping Manor. As well as the Manor House with fish moats and dovecote, she owned three water mills, arable land, meadow and “a certain marsh called Deeping Fen”. She was entitled to tolls from markets and fairs held in Deeping, and annual rents of pepper, cumin seed and 120 hens. She could also claim “work and slavery from natural tenants or natives born there”, valued at £35 a year. 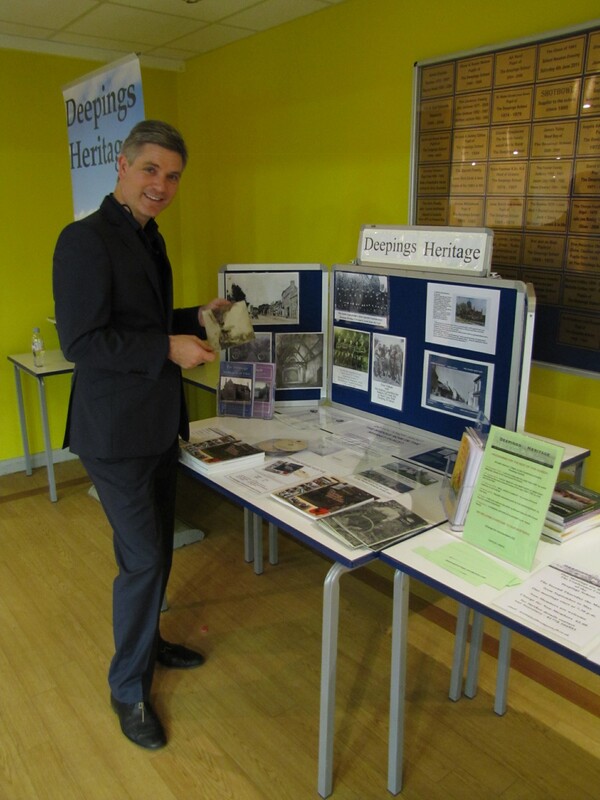 Jonathan Foyle’s talk starts at 7.30pm in the Main Hall at Deepings School. Tickets costing £6 are for sale at Deeping Library, or by phoning Geoff on 01778 343390. Seats may be available on the night, but reserving tickets is recommended. You are warmly invited to St Guthlac’s Church on Sunday, November 11th between 12 noon and 4pm for another opportunity to see the Market Deeping posters, dossiers and photographs of those who served in the war. They were all prepared by the Deepings Remember 1914-18 Group as part of an exhibition in the Community Centre in November 2014. Other items connected with the war, and especially the Armistice and eventual peace, will be on display. ∗ THERE WILL BE NEW INFORMATION TOO. Find out about the 21 men who served, whose names were found in recently discovered Parish Magazines. Are you related to them? We have already located one local family. We hope you will join in remembering the men and women who served – those who survived and those who never returned to their families and to our community. This entry was posted in Local History, Other Events, Our Events and tagged Deeping Wakes Manor, Hereward the Wake, Jonathan Foyle Peterborough Cathedral, Market Deeping Remembers on October 31, 2018 by shipdham.